Destroyit 3803CC is a great choice for office use. Dimensions: 18.5" x 24" x 37.5"
Destroyit 3803CC Cross Cut Paper Shredder is one of the great heavy duty, high volume, centralized office shredder, specially designed to shred large amount of material daily. It includes an "Easy Switch" control element that use color codes and back-lit symbols to indicate operational status. 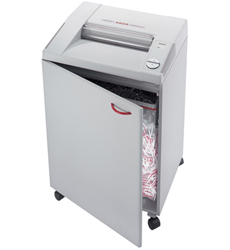 The Destroyit 3803CC stops automatically when your shred bag is full or when the cabinet door is opened it has an high quality, hardened steel cutting shaft which can shred staples, paper clips, credit cards, and CDs. DestroyIt 3803 Cross Cut Shredder comes with double protection against overheating; ESM® (Energy Saving Mode) after 1 hour of inactivity. It also comes with automatic reverse and stop in case of paper jam. The DestroyIt 3803 Cross Cut Shredder features a "SPS" (Safety Protection System) package with a electronically controlled, transparent safety shield in the feed opening. Dimension 40" x 22" x 23"
Lifetime Limited Warranty on cutting shafts and wheels.